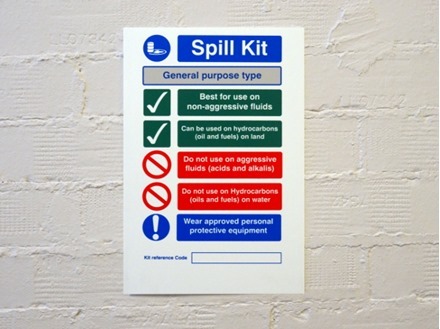 Home > Signs & Signage > Environmental Signs & Tapes > Spill Control & Liquid Storage Signs > General purpose spill kit sign. General purpose spill kit sign. Danger Moving machinery symbol and text safety sign. 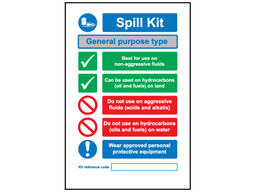 Spill control signs. General purpose spill kit sign. Actions to be taken in event of a spill. Part of our environmental management sign range, for use on non-aggressive fluids, fuels and oils (on land), but not for aggressive fluids (acids and alkalis) nor fuels and oils (on water). Spill management signs. General purpose spill kit. Actions to be taken in event of a spill. ESM011 Size 300mm x 200mm. Material self adhesive vinyl. ESM012 Size 300mm x 200mm. Material rigid plastic.